The Learning Enrichment and Acceleration Program (LEAP) began excavating under the building in 1989, essentially to remove dirts for installation of support piers. With the building nearly resting on the ground, the students literally dug their way from one side of the building to the other. 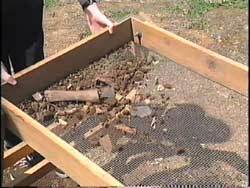 In the process of removing the dirt, hundreds of artifacts were found. 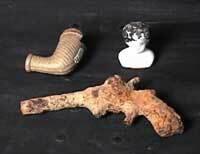 These artifacts give us some clues as to people's daily lives in the building. In a small room that was once the bedroom of Eliza and Amanda Black, many of the artifacts are displayed, along with the showing a TV news feature about the students' excavation.